This mobile plastic recycling station is changing the way plastic can be recycled by turning it into ink for 3D printers. Plastic pollution is all around us, from grocery bags that aren’t properly recycled to islands of plastic floating in the oceans. An industrial designer from the Netherlands is trying to get people to think differently about plastic’s long life cycle. Bart Bleijerveld has never been to the U.S. before, but at a recent green products expo in Pittsburgh, he demonstrates his company’s solution for at least some of our plastic waste. Bleijerveld drops an ordinary plastic cup (the kind you’d use at a party and toss out) into a shredder the size of a shoe box. It’s got metal teeth and you operate it with a manual crank, breaking the cup into small pieces. The confetti-sized pieces are then pumped through the extruder - a machine that heats the plastic to 200 degrees. This is more manual labor, so Bleijerveld gets an audience member to push the warm goo through a small hole. The result is a material that looks a bit like toothpaste, but is actually a high-tech end product: plastic wire that’s the “ink” for 3D printers. They’re used to make just about anything, including prosthetic hands or replacement parts for machines. Bleijerveld’s company, Better Future Factory, uses an industrial scale version of this model to make printer ink from old car dashboards and refrigerators. 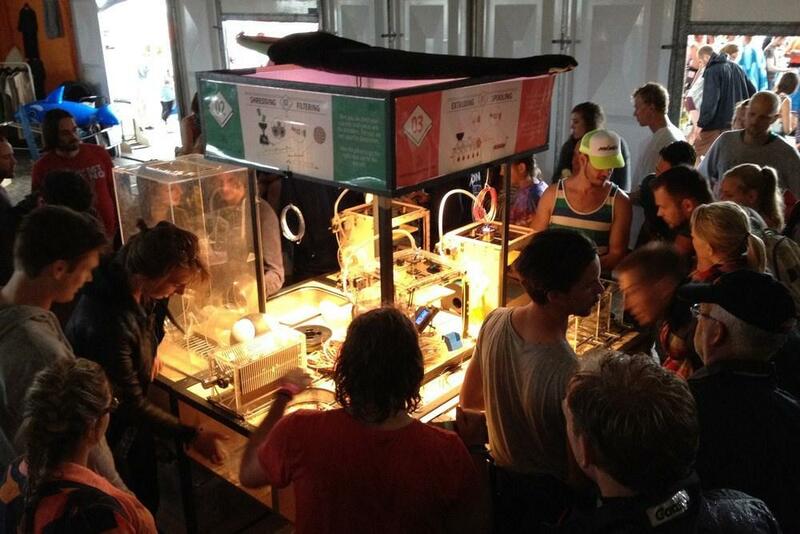 The idea came to him and his colleagues a few years ago when they found out most of the plastic waste at one of the Netherlands’ biggest festivals was a biodegradable cup made from a plastic called PLA. It turns out PLA is also the most used plastic in making 3D printer ink. “Everybody said it was not possible, but we proved them wrong,” says Bleijerveld. At demos like this, the printer at the end of the Perpetual Plastic Project spits out a heart-shaped plastic ring, designed to draw in people of all ages. Bleijerveld says plastic is a useful, even beautiful material. We’re just using it wrong. “If you recycle it into new products, and recycle it into new products, and recycle it into new products, you can actually use the strength of having a long lifetime as a benefit instead of a problem,” he argues. Kara Holsopple is with the environment news program, The Allegheny Front.